"Better shape up...cuz I need a man..."
Marvel really did a genius thing (possibly on purpose) when they had Jae Lee do two covers out of four, of the Widowmaker mini-series. Personally, the only reason I got the first 2 issues of Widowmaker is because of Jae Lee's amazing covers. I particularly like how he signed his name down the leg of Black Widow on the cover of Widowmaker #2. Plus, the Widow's red hair is set in such dramatic angles making for popping and memorable imagery. The art sold me. The collector in me will make me finish out the series. 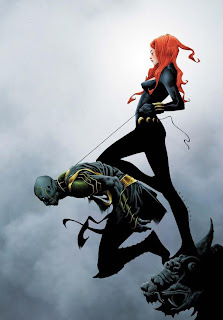 By Marvel pushing stunning art like Jae Lee's, on the comic of the day, Marvel may pick up other readers like myself who are not particularly interested in a Black Widow and Hawkeye story. Once I have the issues I am going to read them, and since I read the first two I will close out the series with the second two...no matter how average the covers are (and they are). If Marvel could only get so many covers out of Lee, then they were smart and shared the wealth of his talent to pick up sales across an array of issues.